I was running through the routine of checking places where my book CRICKET'S MOON is listed and noticed something you might be interested in. If you buy it soon, you save some money! Go to http://www.awe-struck.net/authors/jane_bierce.html and you can get the deal. Well, cheap as I am, fifty cents looks good! I really am proud of this book, more than several of the others that I have written. Some were edited in ways I didn't like, and covers didn't come out the way I envisioned them, but CRICKET'S MOON was barely changed in the editing at all, and one place where the editor suggested a change worked out much better. The cover has to be the prettiest cover I've ever had. Since this is the first book of a three-book series, I'm hoping my characters show through brilliant;y both in this book and the others. CASSIE'S FLAME has already been submitted, and CLEOME'S GARDEN is about to jump out of my head into my computer. I just hope that my readers are willing to give me a break as I write not only in my heroine Cricket's point of view, but go into those of Cassie and Cleome -- young black women -- and their surrounding characters to show the effects of poverty and wealth in a community. As always, my Christian values show through. I can't help it -- I can't write dirty books! It's been a hard last few months. I wrote two whole books, on top of the two that had been accepted by Awe-Struck, and have another to finish. But in the middle of all this, Mundania Publishing bought out first Awe-Struck eBooks, and the Hard Shell Word Factory -- both of whom published my ebooks. It was a surprise, but a good one. I've met the guys who own Mundania and have the utmost respect for them. 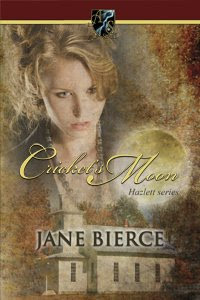 So when CRICKET'S MOON was released July 10 and the cover didn't quite fit the book, the editor and art director came up with a revised cover. In the middle of all this the internet company that I have been subscribed to since April, 1997 (!) lost the server that I was on. In all the adjustments I had to go through, there were learning curves and a few words I don't usually use were muttered. The new cover is only GORGEOUS! Probably the best cover I've had so far, in my 26 years of being a published romance writer. The book is about a heroine who spends her last dollar to buy a lottery ticket, fully knowing that her family frowns on gambling. I hope it makes readers think about what they would do -- and what they can do -- to change the world around them.